Situated on the edge of a 210' cliff in Hood River, Oregon, our boutique hotel conference venue is also ideal for wedding venues, meetings and business retreats, ski vacations, group retreats, a romantic honeymoon vacation or just a very romantic getaway. From this inspirational cliff-edge perch you can take in the splendor of the Columbia Gorge National Scenic Area and enjoy fine dining or pamper yourself at the new spa facility located in the adjacent historic Columbia Gorge Hotel. Discover a world of year-round outdoor recreation, dramatic vistas, historic landmarks, fantastic food, and award winning wine and beer all in Hood River, Oregon. Offering a wide variety of luxury hotel accommodations, our 37 new hotel rooms and villa suites range from 1 to 3 bedrooms with privacy lockout doors, optimal for accommodating families, friends and team building sessions. Each spacious villa combines old-world boutique hotel charm and craftsmanship with exquisite furnishings, spacious living areas, fireplaces, and gourmet kitchens. All of our rooms and suites feature Aveda bath products, plush bathrobes, high-speed internet access, and complimentary parking. 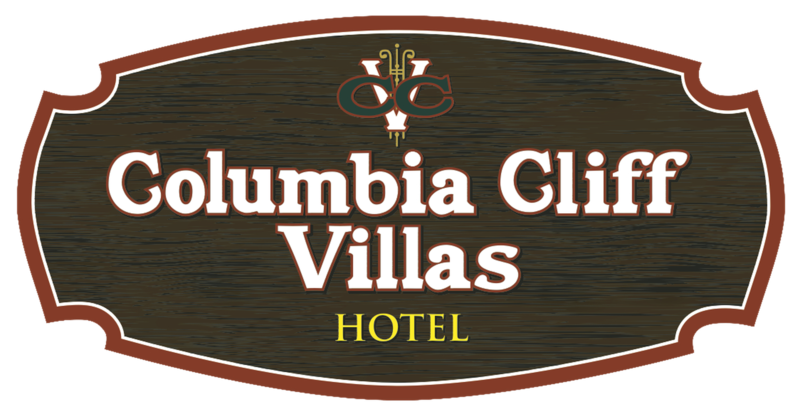 Columbia Cliff Villas specializes in groups and meetings of up to 30-40. Each of our larger suites are perfect for wedding receptions, private celebrations, wine tastings, dinners, business meetings, retreats and much more! Meeting rooms can be combined with additional hotel rooms to suit any need. With exquisite furnishings, convenient location and spectacular views of the Columbia River, your wedding, business meeting or event will be one to remember. Private meeting spaces may include comfortable "soft space" and continuous coffee breaks which allow participants to move around in a comfortable atmosphere to keep business meetings or conferences productive. Our location is ideal for day trips or commuting to Portland...or wherever... whenever. No-hassle condominium living makes extended vacations an easy spur-of-the-moment decision. As a primary residence, condominium owners bask on the sunny side of the Cascades. Located within an hour of PDX and downtown Portland—minutes from the plethora of Hood River recreational, shopping, culinary and wine-tasting opportunities—only steps to The Columbia Gorge Hotel's fine dining, veranda, piano bar, gardens and spa facilities. As a second home, city dwellers can escape the clouds and gray in less than an hour. Reward your busy lifestyle, take advantage of those special over-night and one or two-day opportunities when time allows. Spend a week...or the entire season. All the amenities and dry climate of Central Oregon, without the major expedition. Hood River attracts year-round sports enthusiasts. Known as the windsurfing capital of the world, Hood River also offers kiteboarding, stand-up paddle boarding, mountain and road biking, hiking, golfing, whitewater kayaking and rafting, fishing, world-class skiing, snowboarding, and snowshoeing. The fertile Hood River Valley has been famous for its orchards for more than a century. From blossom time to the turning of leaves, the more than 14,000 acres of commercial pear, apple, cherry, and peach orchards provide miles of scenic beauty. Fruit grown here is of such exceptional quality that the county leads the world in Anjou pear production, and 50% of the nation's winter pear crop comes from Hood River. The local "Fruit Loop" is a favorite with visitors and locals alike. Local Hood River restaurants offer fresh, locally grown food, award-winning regional wines and beer, great coffee, and outstanding customer service. From simple home-style meals to gourmet offerings, there's a lot to sample in Hood River County. The town of Hood River offers a laid-back yet sophisticated dining scene, tasting rooms, and microbreweries. Discover a world of wines all within 40 miles of Columbia Cliff Villas. Just an hour east of Portland, Oregon, the Columbia Gorge Growing Region (AVA) features over 40 award winning wineries and vineyards. The extraordinary and unique combination of climates, soil and geology along with longitudes shared with some of the finest wine growing regions of Europe, make the Columbia Gorge the perfect place to grow and produce a wide variety of distinguished grapes and wines.